Welcome to Convoke Week. 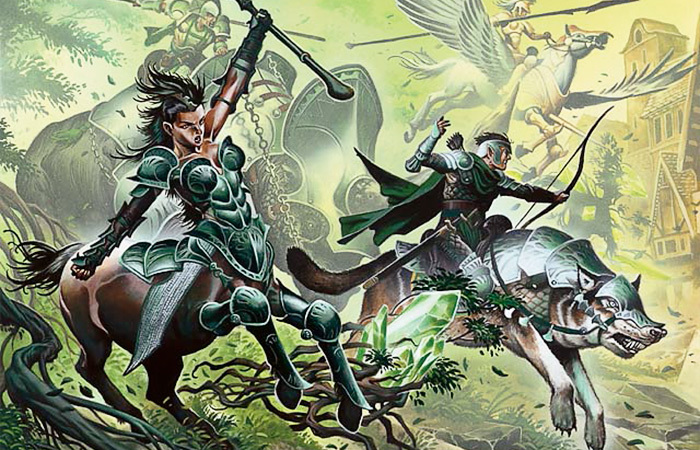 This week, we'll be talking about the Ravnica mechanic making a return showing in Magic 2015. As I have already explained convoke's origin a couple times (here and here), I thought I would try something a little different today. From time to time, I explain that part of my job as head designer is to gauge how much design space is left in any particular design vein. People often ask me how I do that, so today I am going to walk you through the process using an area convoke fits into—cost-reduction mechanics. Before I begin, I should stress that most of this is done internally, meaning that, having worked on Magic for almost nineteen years, I have learned to take all the different things I'm going to talk about today and process it without having to lay it all out, but there's really no way to explain it without showing it in the long form. Also, this process involves all the mechanics, but I am going to demonstrate using just a small sliver—the cost-reduction mechanics. "We Need A Price Check"
Let's start at the beginning—what exactly is a cost-reduction card? It's any card that helps you lower its mana cost. The cost-reduction card will make you jump through some hoops, but if you do, you will end up getting a larger effect for a cost below what you would normally pay. Here's how this article is going to work. I am going to methodically examine all the available space and, when I hit upon something that we've done, I'll bring it up to show what areas have already been used. I'm hoping this will give you all a good sense of what I'm constantly having to process. Now let's walk through these one by one. What's in This Category: The first category includes cards that have a mana cost, but tell you can pay a different, cheaper mana cost. The Bringer cycle from Fifth Dawn is a good example of this subset. Those five cards let you pay instead of a higher cost limited to just one color. You could also pay a cost with more colored mana rather than pay a higher cost with less colored mana. This category will also allow you to pay a cost with some mana of a specific subtype like, say, snow mana. The key is that the secondary cost is usually a little harder to pay than the normal cost, allowing you to get more for less. Future Design Potential: Concentration of color is a key part of the game, so I know we can revisit this aspect many times. The virgin territory is making use of other types of mana. This isn't something we like to do a lot, so while there is some space, I feel it's pretty limited. What's in This Category: These are cards that allow you to spend less mana (and sometimes no mana) by paying some amount of life. The best example of cards in this category are ones that utilize Phyrexian mana from New Phyrexia. Phyrexian mana is colored mana that can alternatively be paid with 2 life. There are also cards like Snuff Out or Rouse from Mercadian Masques, where life was the alternative cost for mana (each color had its own alternative cost, and black's was life payment). Future Design Potential: As life is one of the key resources of the game, I assume this is a well we will revisit often. As far as new design space, there's not a lot left. If I was forced to find new designs, I would look into life loss coming from something other than a direct payment, like damage. What's in This Category: These are cards where you can reduce the cost of your spell by discarding one or more cards from your hand. The Alliances "pitch spells" were the first to play around in this space. These spells allowed you to exile a card in your hand as an alternative cost to playing the card. Mercadian Masques and Coldsnap would go on to explore other effects with pitch cards, with the Coldsnap cycle requiring the exiling of two cards on spells with bigger effects. Future Design Potential: Pitch cards are developmentally dangerous but popular enough that I'm sure we'll revisit them one day. A significant amount of spell space, though, has already been explored. The Spellshapers from Mercadian Masques block added discard as a cost to effects, but we haven't done the equivalent of pitch activations yet where the discarding of a card is an alternative cost. We also haven't really touched upon cards that let you lower the mana cost by discarding a card or cards without paying for the full spell. There's space here to explore but it's also limited. What's in This Category: This category requires you having a particular card or subset of cards in your hand that you then reveal to lessen the cost of the spell. Lorwyn had a cycle of five creatures that required you to reveal a creature of a particular creature type. This cost is quirky in that you are not giving up anything save a little bit of secrecy. The real cost is having to have the necessary card in your hand, which at first blush doesn't feel like much of a cost, but it does put a significant constraint on deck building if you want to consistently play the spell for the cheaper cost. Future Design Potential: Unlike some of the categories above, this one is wide open. Magic has barely scratched the surface of this cost, and because it allows for many different subsets to be referenced, there's a lot of room left in it for future designs. What's in This Category: This subset requires the sacrifice of one or more permanents to lower the mana cost. That could be land—like Vision's Fireblast, creatures—like Mercadian Masques's Delraich, or artifacts—like Shards of Alara's Salvage Titan. Sacrificing Mountains was the alternative cost for red in Mercadian Masques. Future Design Potential: For starters, I couldn't find any cards that sacrificed enchantments or Planeswalkers (something I hadn't realized while we were doing Theros block). In addition, this is a very wide category that hasn't yet produced a keyword, so I believe this is another subset that has a lot of future room for design. Note that we do have mechanics like Shards of Alara's devour that let you sacrifice permanents (in this case creatures) to make the spell more powerful. What's in This Category: This category is a lighter version of the last category. Instead of sacrificing your permanents, you instead return them to your hand to lower the cost. This was blue's alternative cost in Mercadian Masques and led to famous cards like Gush and Daze. Future Design Potential: While bounce as an additional mandatory cost has been used a lot (Planeshift had an unnamed mechanic called "gating," for example), there has yet to be a mechanic, save the blue pitch spells in Mercadian Masques's block, where you can opt into the optional cost. As bounce is less harsh of a cost and combos well with many other mechanics, this subset seems ripe with potential. What's in This Category: Now we finally get to the category where convoke sits. This subset requires tapping permanents as opposed to sacrificing or bouncing them. Convoke obviously requires the tapping of creatures. Tapping creatures was also the alternative cost for white in Mercadian Masques. Future Design Potential: Convoke is a mechanic with a significant amount of design space, so I feel Magic 2015 will not be the last we see of it. It has room for plenty of more spells, as well as future tweaks. In the right set, I could also imagine artifact convoke being a thing. While there is room for some other types of design, convoke does chew up a good deal of this design space. What's in This Category: This category has its mana cost lowered by things of a chosen type being on the battlefield (or in other zones). Players probably best know this subset from the mechanic affinity. In Mirrodin block, there was affinity for artifacts and affinity for basic land types, but the mechanic can work with any permanent subset. Future Design Potential: Affinity for artifacts ended up being overpowered, but I believe with proper developmental oversight and careful consideration of what to have affinity for, this mechanic has lots of potential. What's in This Category: This category has a mechanic, just one we haven't "officially" done yet. The mechanic is delve, and it allows you to exile cards in your graveyard as a means to make your spell cost less. This mechanic was premiered on three futureshifted spells in Future Sight, promising a future where the mechanic would finally see the light of day. We've tried numerous times to fit the mechanic into a set (Innistrad being the boldest attempt) but each time found it didn't quite fit. This mechanic has also been used as an alternative cost, such as on the card Spinning Darkness from Weatherlight. Future Design Potential: I believe delve is not a question of if but when. What's in This Category: This category is the first that really hasn't been done yet. It has you giving up cards in your library (probably exiling them) to pay for the partial or full mana cost of a card. Arc-Slogger, from Mirrodin, experimented with an activated ability where losing cards from your library was a cost, so it's the closest printed card to this category. Future Design Potential: As we haven't done it yet, this subset obviously has future potential. The biggest strike against (let's call it) "library delve" is Arc-Slogger, which, while a very powerful card, was never all that popular. What's in This Category: This category might be hard to describe if we hadn't already done it. The mechanic is suspend and it allowed you to cast your spells for a much cheaper price at the cost of you having to wait a number of turns until the card was cast. Future Design Potential: Suspend went over very poorly, which makes further exploration in this space tricky. Suspend did teach us, though, that there are more costs available in the game than you might realize at first blush. What's in This Category: As we dig deeper into these categories, it will become clear that there are all sorts of costs that can be paid. This subset gets cheaper cards now because it pays for them later (usually next turn). The most famous example was the Pact cycle from Future Sight. Each card was free the turn you played it, but if you didn't pay the mana cost on the next turn, you lost the game. Future Design Potential: The Pacts were popular and powerful but caused a lot of unintentional game losses. This sounds to me like a design space eager for someone to further explore and tweak. What's in This Category: The idea behind this category is that you give up future draws to make your spells cost less. This is in many ways similar to discarding a card, but it can be done even with an empty hand. Island Sanctuary from Alpha demonstrates how you can use giving up future draws as a mean to pay a cost. Future Design Potential: It hasn't yet been done, so obviously there's some design space open. The two big questions are: (1) how much? and (2) would it be fun to play with? I think there's a medium amount of design space and I question if it's fun. What's in This Category: As long as we're playing around with giving up things you don't have yet, why not steps, phases, and turns? Time Vault from Alpha demonstrated that future turns was a commodity to be spent. Future Design Potential: There's potential here, but some of it also is potentially confusing. This is the kind of cost that is looking for the right implementation. What's in This Category: The green alternative cost from Mercadian Masques was not spending a resource but rather granting one to the opponent—in this case, life. This category opens up an entirely new can of worms because it explores not a cost that is paid but one that is granted. Future Design Potential: Giving positive things to one's opponent might not seem exciting at first blush, but with proper design I think there is definitely a future for costs of this nature. What's in This Category: This is another category that isn't about paying costs but rather about having the right circumstance happen. The best example of this subset is the Trap subtype from Zendikar block. These spells had particular mana costs that got cheaper (and sometimes free) if the opponent committed particular actions. For instance, Mindbreak Trap became free if the opponent played three or more spells in the current turn. Future Design Potential: This category is wide open with potential, because there are a lot of different things the opponent might do. The key, as with the Traps, is making sure the spell you're casting feels connected to the action of the opponent. What's in This Category: This category is similar to the last one in that it's looking for a particular event, but it is more flexible as it can be something you proactively do. The best two examples of mechanics in this space are the miracle mechanic from Avacyn Restored and the madness mechanic from Torment. The former lets you cast a spell for a lower cost immediately after you draw it, while the latter gives you the chance to cast it cheaper (on many of the cards, but not all) when you discard the card. The trick to this category is that you are often trying to make the trigger happen. Future Design Potential: This is another category that's wide open with design potential. In fact, I'm sure there are numerous mechanics in this design vein out there waiting to be found. What's in This Category: This is the catch-all category, as all the categories listed above don't cover everything. For example, Land Grant from Mercadian Masques has a cost of showing your opponent you don't have any land. The cost is not having something. That shows that there are a lot of potential alternative costs out there. Note that this category also represents the idea that there are future "costs" to be found that we just haven't thought of yet. Future Design Potential: Another one that's pretty wide open. If not having something is a cost, who knows what else we can find? What's in This Category: This final category really isn't its own category but rather the joining together of two or more of the above categories. For instance, Alliances's Force of Will requires both a life payment and a card payment. Magic 2011's Demon of Death's Gate requires paying life and sacrificing creatures. Any category that we can do can be combined with another category to make even more cards. Future Design Potential: As we find new things we'll always be able to add them together so there's plenty of potential here. I'm hoping today's column gave you a tiny glimpse into the act of figuring out how much design space of a particular mechanic has been used up. Some areas will be much smaller than cost-reduction but others are much larger. As you can see, this is a very complex part of overseeing Magic design. As always, I'm eager for any feedback on today's column. Please feel free to talk to me through any of my social media outlets (Twitter, Tumblr, Google+, and Instagram). Join me next week when I talk about the challenges of telling stories in a trading card game. Until then, may you know the joy of finding an untapped design vein. "Drive to Work #140—Rise of The Eldrazi, Part 5"
This week's first podcast is the fifth and final podcast of my series on the design of the final set of the Zendikar block, Rise of the Eldrazi. My second podcast this week is another in my series "20 Years in 20 Podcasts." This episode, I talk about the year 2001.